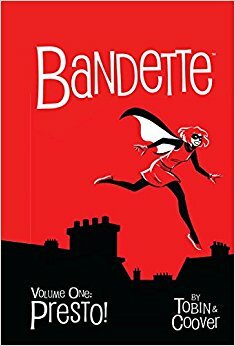 Graphic Novel Review 28/365: Bandette – Dark Horse Week! It’s Monday, and you know what that means, right?? New theme! This week I’ll be reviewing titles from the world of Dark Horse, and believe me, there is no shortage of great Dark Horse books. While I will be splashing Dark Horse titles throughout the 365, this week will feature seven heavy hitters. I’ve been a fan of Dark Horse for a while, but this past June at ALA, they were very receptive to the work that we are doing in the classroom, and they gave us a chunk of books to show off what they offer to the world of education, and they made me even more of a fan. This week I am happy to review some of these splendid titles, and you might want to bring some of them to your classroom! Bandette Vol. 1: Presto is a Dark Horse collection (issues 1-5) of the Eisner winning digital comic from MonkeyBrain. A few friends were excited to see that I was about to review this book. I had never heard of it, but it seemed to be coming highly touted from reliable sources. This book, fairly simple in panel layout and bold in foreground coloring, will put a smile on your face. For Bandette is a thief; a very good thief (excellent you might say) that plays more to the side of good than evil – think Robin Hood or the classic video game series Sly Cooper – but she is far from a stereotypical thief. 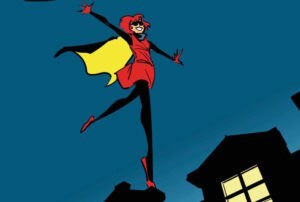 The first thing that struck me about the character of Bandette is her whimsy. Bandette never seems to have a worry. Floating about on rooftop to rooftop dodging bullets and swords, she never loses her cool or her sense of humor. My favorite line comes in one particular battle as the sword-wielding Matadori slices through Bandette’s cape and states, “Hah! And Hah! And Hah again!” Bandette replies with a simple “Three Hahs? Is that not Wasteful?” Then she goes on to engage Matadori in a conversation about where she had her cape made…as the battle continues. Bandette teaches us a valuable lesson about not only finding enjoyment in everything one does but also that we must not worry ourselves…pretty much, about anything. People are out to kill her; she knows this; and she can’t be bothered because she’s secure in her dopeness and is confident that good will prevail. On top of all else, this is what sells me on Bandette. She’s a joy. Also, while action packed, this book never feels excessively violent, so it’s good for younger readers. I’ll calling 10+ on this book for that reason.